1.1.1. 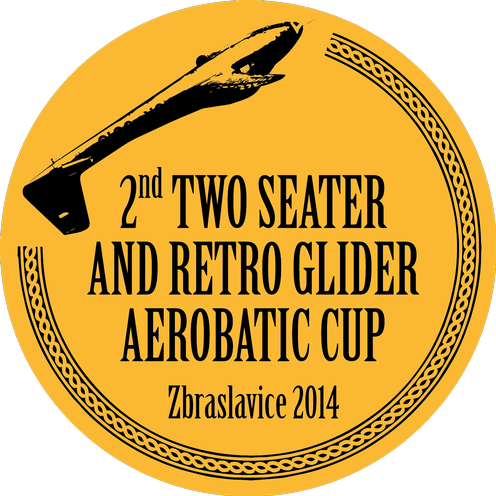 The 2nd Two Seater and Retro Glider Aerobatic Cup 2014 (TSGAC) will take place under the auspices of the Czech National Aeroclub. 1.2.1. The event will take place at Zbraslavice Airfield, located about 63 km southeast from Prague, the capital of the Czech Republic. Aerodrome operator: Aeroclub Zbraslavice o.s. 1.2.3. The event will take place in the period of time: May 15th to May 18th 2014. 1.3.1. Familiarization flights at Zbraslavice Airfield will be possible from May 13th till May 14th 2014. The competition box will be marked during familiarization flight days. 1.3.2. Earlier training flights are possible with previous agreement of the Organizer. In case of need, please contact the Organizer via e-mail: vlp@lkzb.cz or via the contact information in part 11 of this document. 1.3.3. Training at other airfields in LZDB vicinity is possible with previous agreement with the Organizer. In case of need, please contact the Organizer via e-mail: vlp@lkzb.cz or the other contact information in part 11 of this document. 1.3.4. Slots for familiarization training days will be published using the information system at www.acro-online.com and at the official contest website www.tsgac.cz. 1.4.1. Official working hours of the Contest Office and Organizers will be from 08.00 to half an hour after the landing of the last competitor. 1.4.2. These hours are valid for any official inquiries or information or deposit of claims/protest concerning the contest during the contest’s period. 1.4.3. All times are stated in local time (LT=UTC+2 hrs). 1.4.4. The Schedule may be changed due to technical and organizational reasons as well as the weather conditions. 1.4.5. One additional day in the Schedule is included for cancellations of flights due to weather and due to organizational reasons. 1.4.6. Everyone participating is also invited to hangar party with lot of food, drinks, music and fun on 17th May (SAT) after Closing and Awarding ceremony at the airfield. Note: Czech National Aerobatic Rulebook is based on the FAI Sporting Code, Section 6 and General Section. The Rulebook contains only specific rules modifications. All other untouched statements in the FAI Sporting Codes are valid as is. • Two Seaters – Two seater acro gliders with exception of MDM-1 Fox and Long Fox Pinocchio. • Retro – Acro gliders with at least 50 or more years from its first prototype takeoff. Note: Category will be opened when there are at least 3 competitors. 2.3.1. Standard box according to FAI Sporting Code, Section 6 Part 2 will be marked except center line “I” marks. “T” and/or corners and cross will be deployed. 2.3.2. No Line Judges will be used. 2.3.3. Box infringements will be evaluated electronically using advanced HMD units supplied by the Organizer. 3.1.1. The official languages during the 2nd TSGAC 2014 is Czech and English. The language of all communications and briefings is English if any non-Czech speaking competitor will be present. 4.1.1. Any competitor may participate at the 2nd TSGAC. Competitors from same countries will be grouped into teams. Teams will be represented by the Team manager. 4.1.2. Participants may participate as national team member or as an independent. Independent competitors will be excluded from team results. They will not be excluded from overall results. • a valid personal insurance policy. 4.2.1. All participating aircraft must satisfy the performance criteria essential for competition flights in the advanced/unlimited aerobatic category. 4.2.2. For all competing aircraft a valid Certificate of Airworthiness of the related country must be presented. 4.2.4. Each competing aircraft must be insured against 3rd Party Public Liability, according to EU Regulation (EC) No. 785/2004, claims with a minimum amount as mentioned above according to MTOW. Aircraft arriving in the Slovak Republic must be able to present their insurance policy with a copy in English, certified by the Insurance Company. 4.2.5. Each competition glider should have mounted a unit for placing the altimeter encoder for using the HMD. HMD mount has to be in compliance with FAI Sporting Code, Section 6 Part 2, 10.7.1. Organizer will provide mounting of the HMD holder free of charge, but competitor is responsible to note Organizer in sufficient time prior to the contest. 4.2.6. Hangar space for competing aircraft will be available free of charge for the period of the Championship. 4.2.7. In case of insufficient hangar capacity, priority will be determined by the Organizer. In case of doubt, the order of received applications to the contest will be taken in account. Note: Available hangar capacity is 30 glider aircrafts! 5.1.1. The Preliminary Entry should be provided to the Organizer not later than March 31st 2013. 5.1.2. The Official Entry Forms must be provided to the Organizer not later than April 31th 2013. 5.1.3. No additional fees will incur in case of payment on site. 5.1.4. Entry Fee payment must be done till Opening briefing (till May 14th, 18:00). 5.1.5. Any participant wishing to query the arrival and clearance of their fees should contact the Organizer using e-mail vlp@lkzb.cz or the other contact information in part 0 of this document. 5.1.6. Entry Fee must be paid in full amount and bank fees must be charged to sender’s account. • Ordinary mail - send your applications to AEROKLUB ZBRASLAVICE at the address specified in part 11.1. • Electronically using email – use email address vlp@lkzb.cz in which case registrations should be considered as valid after confirmation. • Electronically using the information system at website www.acro-online.com. 5.2.2. The Organizers would ask Competitors, Officials, Team Members and Observers registration to use the information system at website www.acro-online.com. More information about the registration process can be found at this web address. 5.2.3. In case of any problems with signup, registration or any other relevant issues, please contact the system administrator at vlp@lkzb.cz or admin@acro-online.com. In need of urgent help please call +420 777 189 173. 5.3.1. The Free sequence of each competitor should be submitted not later than at the opening briefing. 5.3.2. The information system at www.acro-online.com will provide the ability to upload the competitor’s Free sequence (one month before beginning of the contest). 5.3.3. As a second option, competitors may submit their Free sequence to the e-mail address vlp@lkzb.cz. Every submission will be confirmed. Free sequence submissions are not valid without confirmation. 5.3.4. Free sequences should be submitted using either Microsoft Visio Aresti software or Olan file format. PDF file format or even hand drawn hard copies of the complete ABC form with the competitor’s Free sequence will be also accepted. Note: Competitors are advised to use new sequence drawing system at www.openaero.net. It’s free of charge and fully updated. Functionality is very close to OLAN system. Note: There is one entry fee for crew for two-seater category. • Official and social functions. • Program arranged by the Organizer. 6.1.4. Full amount of the entry fee will be refunded if competitor withdraws from the competition before beginning of the Opening briefing. 6.1.5. No entry fee will be refunded if competitor withdraws from the competition after beginning of the Opening briefing. 7.1.1. Towing will be provided using two towing planes plus one as a back-up. Main towing plane will be Z 226MS (Zlín-Trener), PA-25-235 (Piper Pawnee). 7.2.1. Prices will be the same for training and competition flights. 9.1.1. Organizer will help with securing accommodation. In case of need please contact the Organizer using information at pa.
9.1.2. Camp will be situated at LKZB airfield area with cost of 90 CZK (approx. 4 EUR)/night per person. 9.1.3. Accommodation at the airfield (2-4 beds per room) with cost of 150 CZK (approx. 6 EUR) night/per person. Note: Accommodation services for competitors are not included in the entry fee. 9.2.1. Three meals per day and refreshment for all participants will be available in local restaurant. One half of the restaurant/briefing room will be fully dedicated to competitors/officials. Note: Catering services for competitors are not included in the entry fee. 10.1.1. Officials will be announced later at contest website. Name of Bank: Česká Spořitelna a.s.